RI63 is now completely sold out. Many thanks to everyone who purchased a copy. RI63 will be on sale Friday night at the Wexford game, outside the ground, from 7 pm til 8pm, and again outside Tolka at full time. This month’s issue contains a look at last month’s fans forum, pyro on the pitch, podcasts, Prenton Park 20 years on and all your usual favourites as well as a whole lot more. It is a 32 page edition, all for a mere €2. The remaining copies will go on sale on Friday at 7 before the Cobh game, or alternatively are available delivered to your door for €3. Many thanks to everyone who bought a copy on Friday night. On 5 October 2016, Reds Independent issued a statement that called upon the board of Shelbourne FC to explain two simple things which they publicly stated in their own statement issued the previous day. In the absence of a published response to these matters, we regret that we again must ask supporters not to pay into home league matches nor any cup matches that the club are entitled to a percentage of gate receipts from. We also ask supporters not to buy any product that will fund the club nor to fund the club through any form of sponsorship. We encourage supporters to continue to support the team on the pitch and to attend away games in order to do so. 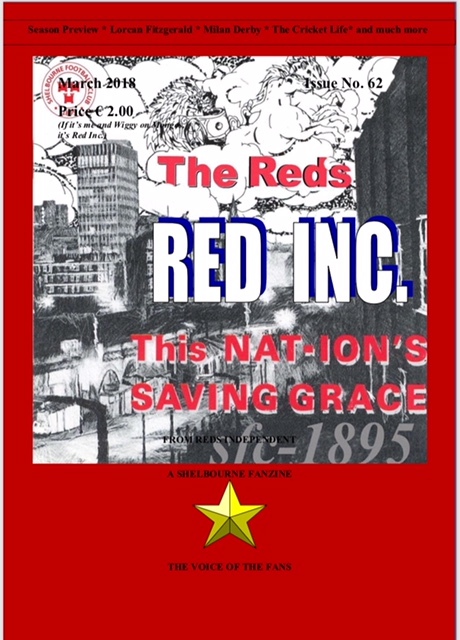 Red Inc. Issue 59 will be on sale Saturday night at the Waterford United game, outside the ground, from 7 pm up til kick off, and again outside Tolka at full time. This month’s issue contains a look at the potential effect of Dundalk’s Euro success, focuses on the latest on Dalymount, RI FactCheck, a look back on the Doherty era, a feature on a Red at Euro 2016 and all your usual favourites as well as a whole lot more. It is a special 36 page end-of-season special edition, all for a mere €2. Red Inc. Issue 58 will be on sale Friday night at the Cobh Ramblers game, outside the ground, from 6.20 pm up til kick off, and again outside Tolka at full time. This month’s issue contains a look at Red identity, a review of up and coming Dublin band Oski Bravo’s debut single, a focus on the return of begging bowl season, we catch up with the affairs of our former Euro opponents and all your usual favourites as well as a whole lot more. It is a special 32 page edition, all for a mere €2. 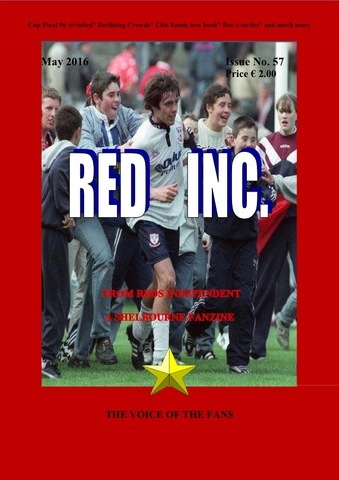 Red Inc. Issue 57 will be on sale Friday night at the Athlone Town game, outside the ground, from 7 pm up til kick off, and again outside Tolka at full time. This month’s issue contains a look at Doc’s tactics, a review of Chris Sands’ new book, an examination of declining attendances, the return of Gah season and all your usual favourites as well as a whole lot more. It is a special 36 page Cup Final 96 commemoration edition, all for a mere €2.